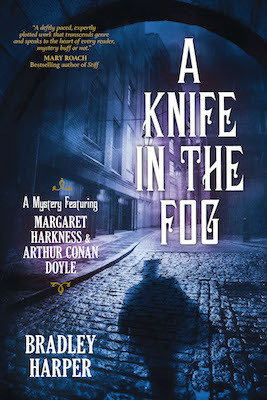 The following is an exclusive excerpt from A Knife in the Fog, by Bradley Harper, featuring fictionalized versions of Arthur Conan Doyle and Margaret Harkness investigating crimes in the East End. In the following passage, we take a tour of Whitechapel in the time of Jack the Ripper. We set forth as the lengthening shadows announced sunset. Miss Harkness’s apartment on Vine Street was near Fenchurch Street Railway Station, and we bore in a northeasterly direction toward Whitechapel Road. She explained this was the main artery in the East End. By knowing that roadway, she said, I would always have a reference point within the labyrinth. As we walked I learned something of her personal history. She told me she had grown up in Worcestershire, the daughter of a conservative clergyman. She came to London as a young woman to become a nurse, eventually becoming a dispenser of medications on the wards. After a couple of years, however, she found the life planned out for her by her father too restricting, so she struck off on her own to pursue a career as a writer, working as a freelance journalist and author. Miss Harkness assured me, with no trace of regret, that her current career was not approved by her conservative, middle-class family. I would have inquired further as to how a woman with such a proper upbringing could have found herself wandering the East End in male attire, but the more personal my inquiries, the faster her pace, and I soon had little breath for conversation. Some of the prostitutes gave a quick nod to Miss Harkness as we passed, while giving me a curious stare. Apparently she was acquainted with many. I was grateful our need to navigate the crowded streets kept Miss Harkness from seeing the vivid color her last comment surely inspired. I was quite unused to such language from anyone, least of all a lady of respectable class and education, as she obviously was. The contrast between her evident good breeding and casual use of such coarse references left me speechless, but also intrigued. I could see time in her company would not be boring. I saw desperation and resignation on the faces of the men, women, and children about me—not defiance. I saw desperation and resignation on the faces of the men, women, and children about me—not defiance. I suspected it would take at least three hearty meals before they could find the strength to rebel against anything. We passed children playing in garbage, blood from nearby abattoirs staining their bare feet. The smell of unwashed humanity, mixed with smoke and cheap gin, pervaded. I struggled to imagine what their daily lives must be like, and I confess it was quite beyond me. In retrospect, perhaps that was more due to a lack of will than imagination. Time has blurred much of what Miss Harkness showed me, but I do recall asking to go to the sites of the two most recent murders. I realized any possible clues had been washed away long ago, but the writer in me wanted to visualize as clearly as possible the moment of the killer’s action, and the sort of place he would choose to attack his victims. We were approaching the Royal London Hospital by this time, so we proceeded on to the site of Mary Nichols’s death in nearby Buck’s Row. Enough time has passed since the alleys of London ran red with the blood of murdered women, that most of you reading this would not have lived through those terrible times, so permit me a moment to recount the circumstances of her death. At three-forty on the morning of the thirty-first of August, a carter named Charles Cross discovered a small bundle in the roadway near the old Boarding School, which still stands today. It was lying in a gateway on his left, and thinking it a discarded tarpaulin and perhaps useful, he approached and discovered it was a woman lying upon the ground. As Cross stood over her, he heard footsteps behind and turned to find a fellow carter, Robert Paul, also on his way to work. Cross called him over. Together they found the woman on her back, her dress pulled up around her waist. Cross later said her face was warm, though her hands were cold. Paul testified he thought he felt weak respirations from her chest. They pulled down her skirt to preserve her decency and, feeling they could do no more for her, each went his way, promising to notify the first policeman they encountered. Later examination of the body made Paul’s belief that Mary Nichols was still alive doubtful, as her throat wound was so severe she was nearly decapitated. Within moments of their departure, Police Constable John Neil independently discovered her corpse. He later stated he had passed by the area thirty minutes prior, and that both then and at the moment of discovery he’d seen no one else there. With the aid of his lantern, he noticed the wound to the throat and found her arm still warm above the elbow. At that moment he spied Police Constable John Thain passing by the end of the street, and flashed his bull’s eye lantern to summon him. A series of events then happened in rapid succession: Thain went posthaste to fetch Police Surgeon Llewellyn; as Thain departed, PC Mizen arrived after being told of the body by the two carters. Neil sent Mizen off to gather reinforcements to secure the area and fetch the police ambulance. Doctor Llewellyn arrived at around four o’clock, only twenty minutes after the initial discovery by the first carter. Llewellyn pro-nounced the woman dead and noted that, while the hands and wrists were now cold, the body and legs were still quite warm. He surmised that the time of death was not more than thirty minutes prior. News of the murder rapidly spread through the neighborhood. One spectator of interest was Patrick Mulshaw, a night watchman from the nearby sewer works. He stated that at approximately four-forty, a passerby had remarked to him, “Watchman, old man. I believe some-body is murdered down the street,” and Mulshaw immediately went to Buck’s Row. Later attempts by the police to locate this mysterious informant were unsuccessful. The gathering crowd made Doctor Llewellyn uncomfortable. With the arrival of the police ambulance—a lofty title for a simple wooden handcart—he ordered the body removed to the morgue, where a proper examination could be made without boisterous comments from onlookers. Only after the corpse arrived at the morgue, and after examination by Inspector Spratling, was it discovered that the victim had been disemboweled. I credit the covering of the abdomen by the two modest carters and Doctor Llewellyn’s desire to remove the body quickly from a growing crowd for this lapse. During the inquest, however, the coroner was unsympathetic regarding the delay in the discovery of the abdominal wounds, and cited it as evidence of the general incompe-tence of both Doctor Llewellyn and Inspector Spratling. Miss Harkness and I arrived at the location of the murder at around eight o’clock, by which time the sun had fully set, and it was not difficult to imagine movement in the shadows. Miss Harkness and I arrived at the location of the murder at around eight o’clock, by which time the sun had fully set, and it was not difficult to imagine movement in the shadows. Looking about, I was struck by the nerve of the killer to perform such a vicious attack in an area so heavily populated. The fatal injury must have been inflicted with such savagery and accuracy that it immediately rendered his victim incapable of sound or resistance. I stared long at the battered cobblestones so recently covered in a woman’s blood. We were about to go to the second spot when our evening took an unexpected turn, and I saw another side of my well-educated and published companion. A large man suddenly appeared out of the shadows I had found so threatening just moments before. I smelled him at the same instant, reeking of gin and of body and clothes that had not seen hot water for at least a fortnight. He held a straight razor in his right, slightly shaking hand, his intent obvious even before he spoke. His pale face was distorted by a leer made even more disturbing by his gray complexion in the darkness. I started to step forward to place myself between this scoundrel and Miss Harkness, when she moved past me in a blur. She pressed a small handgun up against his neck so quickly that to him it must have appeared by magic. Our erstwhile assailant dropped his blade to the pavement with a stricken look on his face, mumbling some vague apology. Miss Hark¬ness stepped back and watched him until he disappeared once more into the shadows. After he was gone, she bent over to retrieve his weapon, folded it with care, and placed it in her pocket before turning to me. I asked to see the weapon she had used to thwart our robbery. I had little personal experience with firearms, and I was fascinated by this diminutive version. Our traditional roles of man as protector and woman as the protected were reversed for the remainder of the evening (though thinking back, they had been all along), as Miss Harkness led me to the nearest place a cab was available. Perhaps I should have been ashamed at being rescued by a woman, but at that moment my only emotion was gratitude. I comforted myself with one thought as we made our way back to Whitechapel Road: Miss Harkness was definitely not boring. Once I was safely aboard, she bowed slightly, maintaining her masculine facade, and slipped back into the dark, noisome warren of the East End as though she had never been. From A KNIFE IN THE FOG. Used with the permission of the publisher, Seventh Street Books. Copyright © 2018 by Bradley Harper.